Can transparency promote resource governance? Transparency and accountability initiatives have emerged as a potential solution to combat corruption and increase public benefits from the extractive sector in resource-abundant countries. The Extractive Industries Transparency Initiative (EITI) is one such initiative, through which 49 resource-rich countries have disclosed a cumulative 282 fiscal years of government revenues amounting to US$1.9 trillion since 2003. Eric Werker, Dr. Nadja Kunz, and Delgermaa Boldbaatar from the EITI Mongolia have developed and applied a new framework to consider how transparency initiatives (such as EITI) could enhance citizen empowerment and ultimately improve resource governance. The authors unfolded and evaluated the evidence in a recently published research article stemming from their work. The article can be downloaded directly from the following link. Transparency initiatives have emerged in efforts to combat corruption and increase public benefits from the extractives sector. We explore the effectiveness of resource contract transparency for increasing public benefits from the extractives sector. 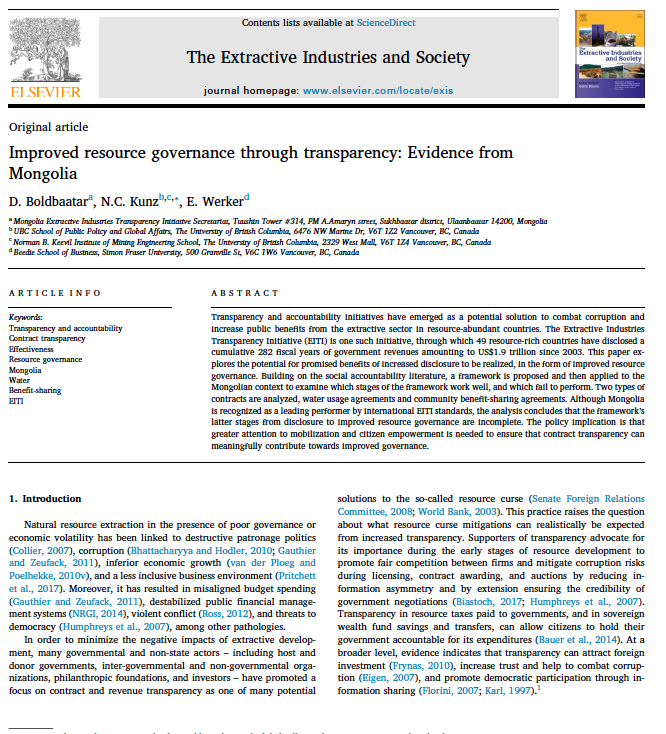 A framework is developed and applied in Mongolia to consider how transparency could improve resource governance. The stages of the framework are found to be incomplete in our case studies of water usage and benefit-sharing agreements. Future research should consider how transparency can enhance citizen empowerment and ultimately improve resource governance.